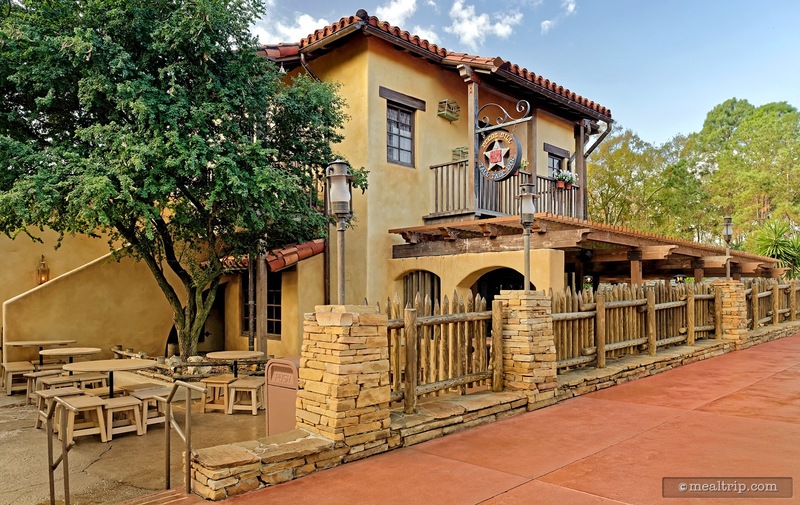 Both the interior and exterior decor of Pecos Bill’s Tall Tale Cafe have to make a transition from Frontierland to Adventureland. 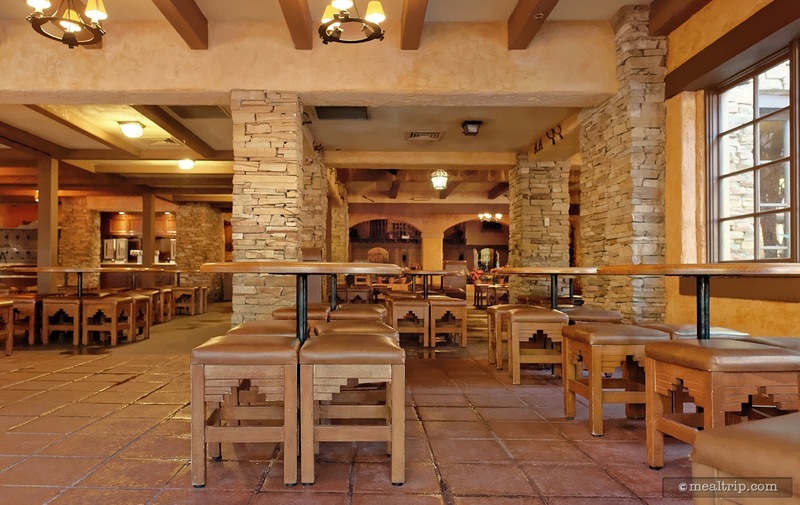 A little "old west saloon" mixed up with some "south of the border hacienda"... make for an iconic quick service location. 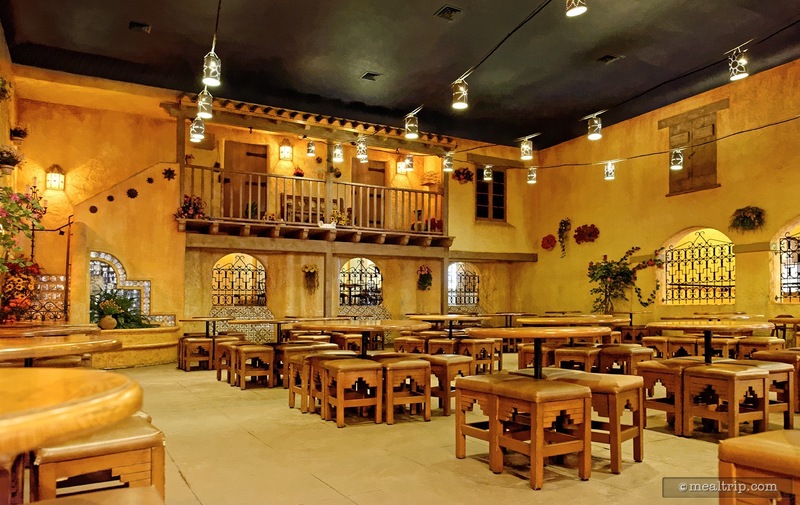 The interior details only become visible after your eyes get acclimated to the aptly dim, somewhat relaxing environment. 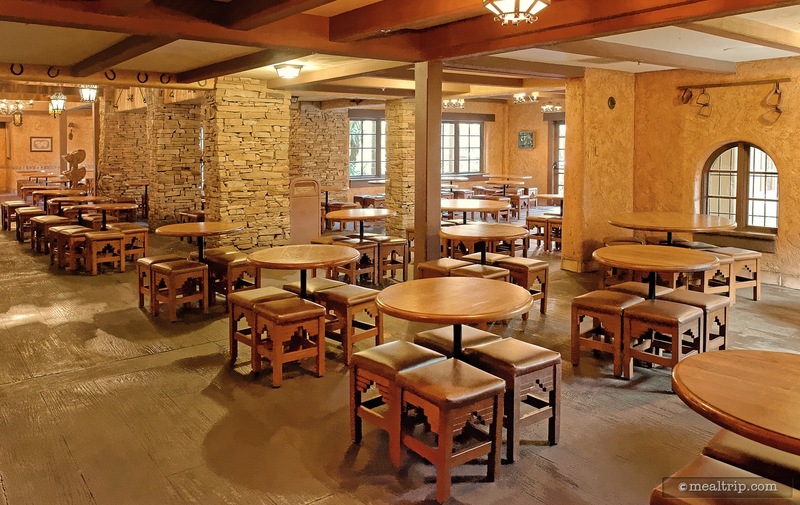 It's important to note that none of the stool-type chairs at Pecos Bill's have backs on them, so "relaxing" is something you'll have to do hunched forward, or sitting straight up. The aroma of freshly grilled onions and mushrooms when exiting the Country Bear Jamboree, had been one of Pecos Bill's aromatic trademarks. While the toppings bar is still there, the aromas are more Tex-Mex these days, as Pecos Bill's menu has shifted more South and less West. It's hard to tell if it's going to stay that way though. It seems a few items from the old menu (like the Southwest Burger) have made it back onto the Text-Mex menu, along with the new Fajita Platter, Beef Burrito and Nacho entrees. 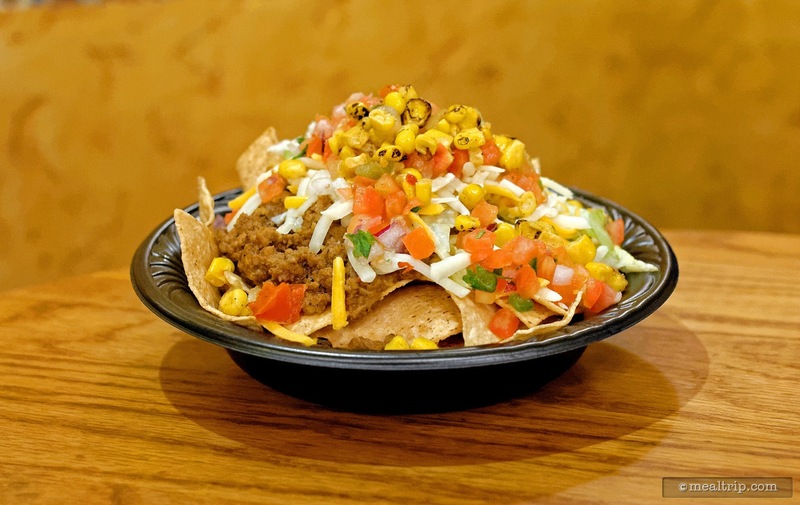 I tried the Nachos and enjoyed the freshness of the crisp nachos and tasty beef. I spotted the toppings bar and found several food items I like to make these nachos the best nachos in the park because everyone has their favorites. 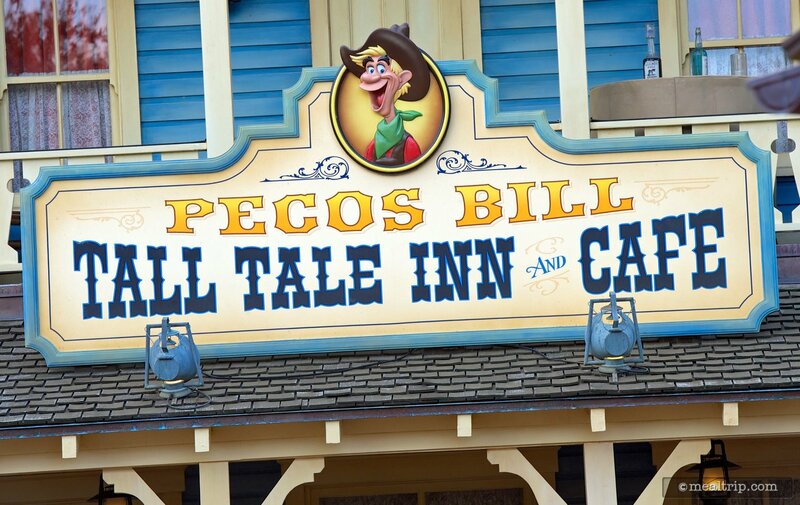 I enjoyed every bite and look forward to this experience of fun food on future visits to Pecos Bills. 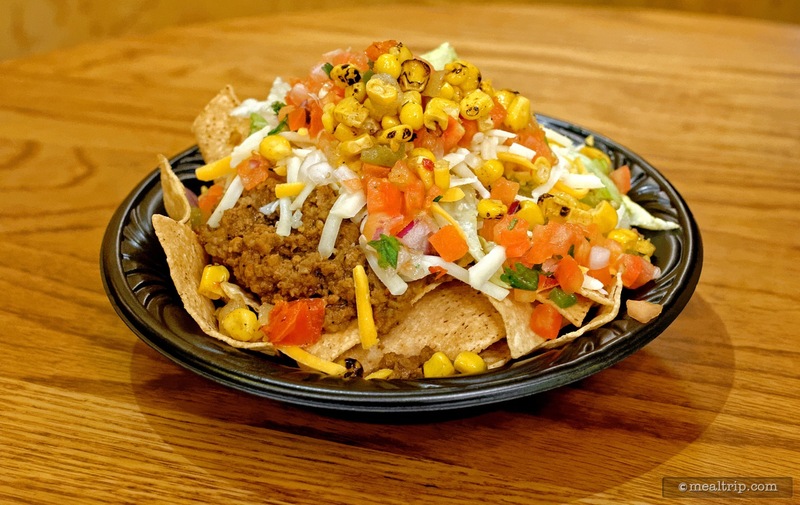 On a recent visit to Pecos Bills in the Magic Kingdom I noticed a few versions of their Beef Nachos that looked quite different from table to table (because, yes… I do look at other guests food as I'm walking through the restaurant). 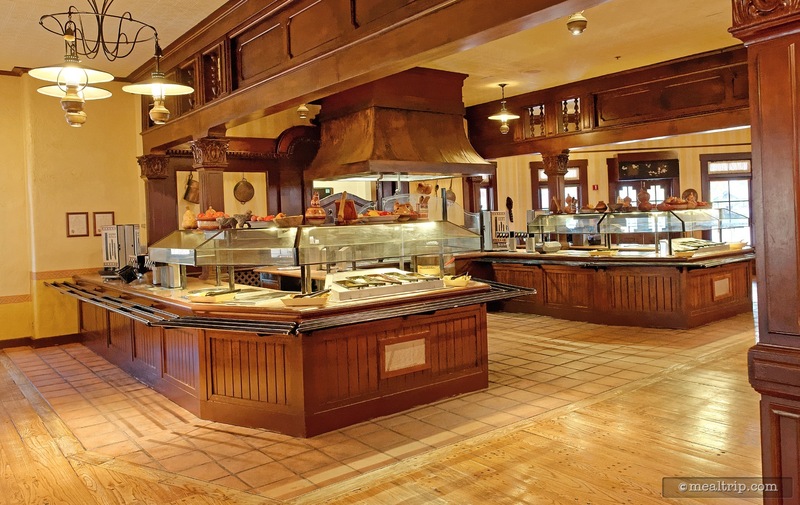 Back in the day, when Pecos Bill's was a little more Tex than Mex, you could get a "base burger" and then visit the toppings bar to customize your burger in a number of different ways. You can still do that today... but for some reason, it didn't dawn on me that you could also take your bowl of Beef Nachos to the toppings bar! That… is what accounted for the difference in what I was seeing from table to table. 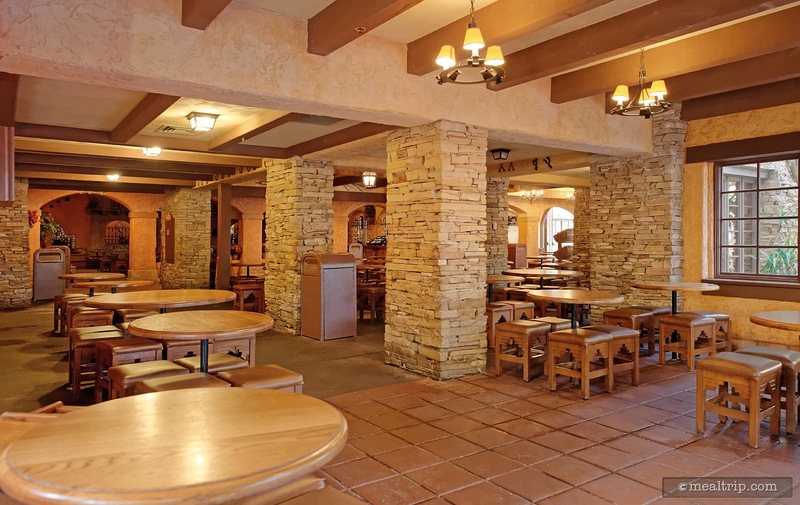 As it turns out, you can pretty much take anything you purchase at Pecos Bill's to the toppings bar… although unless you like salsa on your cinnamon churros… just because you can, doesn't mean you should. Back to the Beef Nachos… basically what you get out of the kitchen, is a little sparse looking. There's some chips and some beef, and a few pieces of lettuce and a diced tomato or two. That's about it. The toppings bar however, is chocked full of Tex-Mex goodness that you can pile on a mile high… or at least a few inches. There's roasted corn, guacamole, red and green salsa a couple kinds of shredded cheese, sour cream, sliced jalapeños, and black beans… basically everything you need to get some good (American-style) Tex-Mex happening. The only thing I'm missing here, is a Corona. 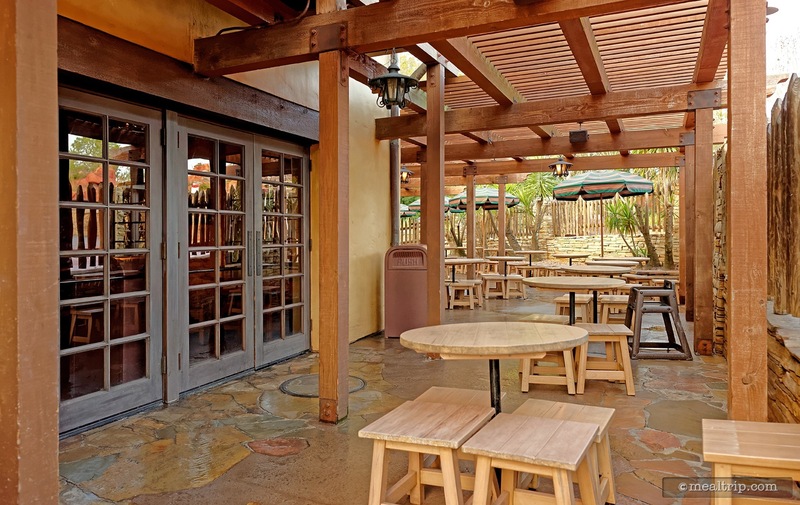 Since we all know that Pecos Bill's is in a "dry" territory (sigh), I'm not likely to find one any time soon. 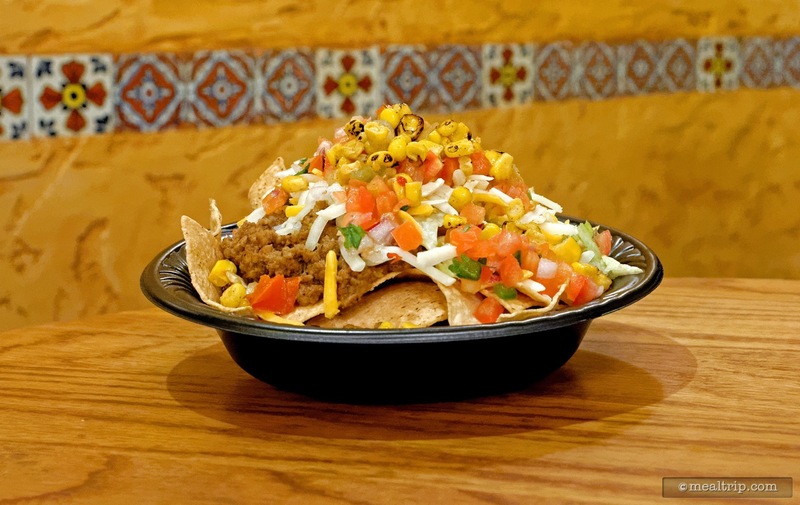 Yes, after a trip to the toppings bar, the $11.99 Beef Nachos (summer 2016) started looking like a real dish. I'm also happy to report, that these nachos would be right at home on any casual-service restaurant's appetizer menu. The chips (while not being particularly authentic) were solid and didn't turn into a soggy mess. The seasoned ground beef is where the real savory nature of the dish came from. It was probably "seasoned" with salt more than anything, but when mixed with all the toppings (and the sour cream in particular) everything seemed to balance out quite nicely. At the end of the day, these really aren't supposed to be "authentic" South American nachos, as much as they are "fast food tailgate party" kind of nachos… and to that purpose, they really hit their mark. It's a totally shareable dish as well, which makes it a great in-between meal snack when there's two or three people in your group. Because you can customize the dish by visiting the toppings bar… there shouldn't be anything on it, that you don't like. There are even little take-away cups at the topping station, so if you're splitting the nachos, everyone can get a little bit of what they want! I was disappointed the pulled pork sandwich was not on the menu. While here I tried a new item (the charro nuggets). The wait for this treat was longer than expected. They were all right but I would have preferred a dark chocolate or some sort of berry sauce to dip them in. They were different from the cupcakes found everywhere and a bit cheaper but nothing I will return for more. 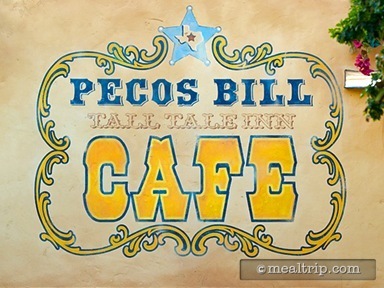 I haven't really dined at Pecos Bills since they converted the menu to Tex-Mex. 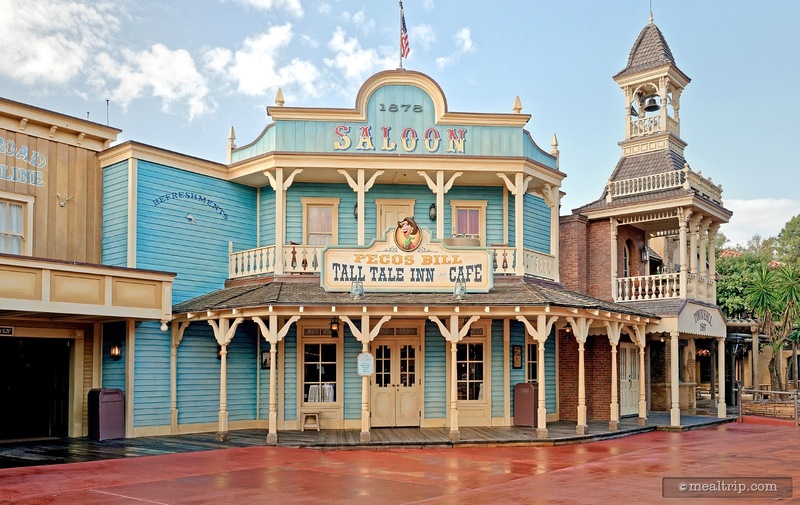 I miss the burgers and those topping bar smells wafting in the air as you exit the Country Bear Jamboree and get dumped right smack into the corner of Pecos Bills. Yes… there are still smells… but they're more of the Fajita and pepper variety than the sautéed onions and beef smells of yesteryear. 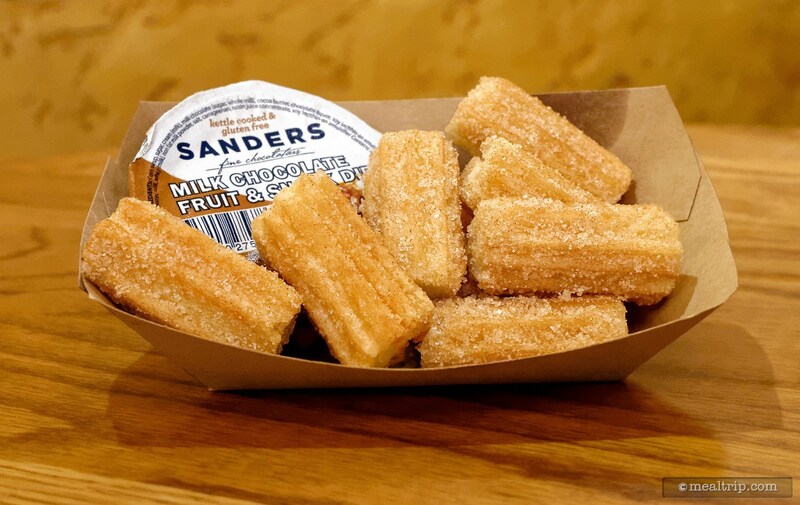 It looks like Tex-Mex is here to stay though, and so I'm taking baby steps and trying a transition food at Peco's… the Churro Nuggets (or mini churros as they like to call them) with Chocolate Dipping sauce. I consider the dessert nuggets a transition food because they don't really seem to fit into either a Southwest Burger theme or a Tex-Mex theme. While I choose to trace the origins of the churro back to Portugal, most would simply consider them a carnival food item that would seemingly be more at home in Casey Jr & Pete's Circus Tent-land (well shoot... they're just calling that Fantasyland now aren't they?). Anyhow, the Churro Nuggets at Pecos Bills were good. Not great, not bad, just good… just tasty enough so that no one should complain about the $5 price tag (hey, it's less than most cupcakes at the Magic Kingdom). While mine were slightly crunchy on the outside and soft on the inside, they were a bit doughy and oil-heavy. That tells me they were cooked too long with a lower than needed heat, or they simply sat under a heat lamp for too long after the frying process. They did seem a bit salty (for Churro dough anyway) but most won't notice that under the cinnamon, sugar, and chocolate sauce. The "milk" chocolate sauce (a gluten free product from Sanders)… was good. Just for my personal tastes, I would have went with a dark chocolate sauce, (because the churros themselves have sugar and cinnamon on them), or something completely different, like a punchy raspberry. All in all… a good warm dessert/snack that works just fine in context. Will they become a legendary must-get snack like the Dole Whips? Probably not. 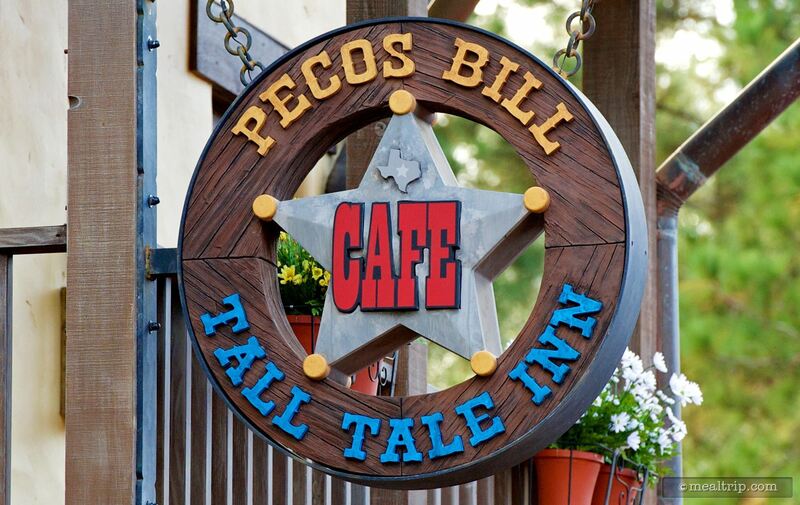 I'll be back Pecos Bills… in the name of research. 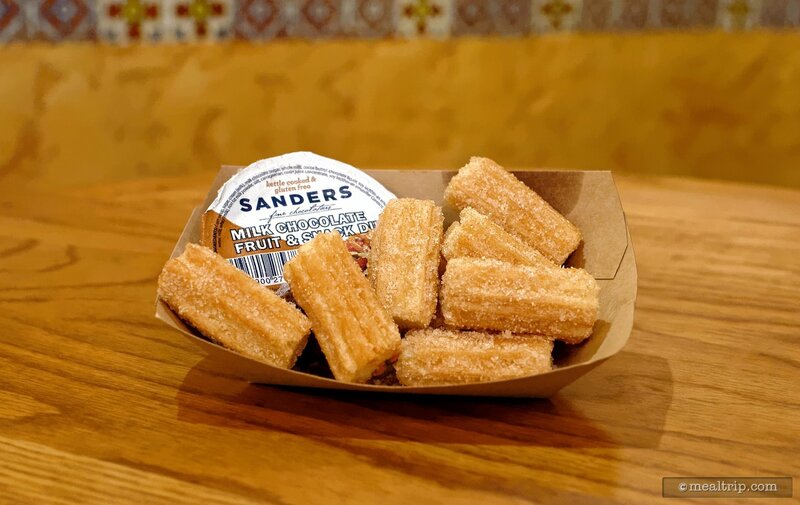 Actually, some of the food items that I spied on the plastic trays of walkers-by as I enjoyed the Churro Nuggets looked pretty interesting, and worthy of a closer examination. 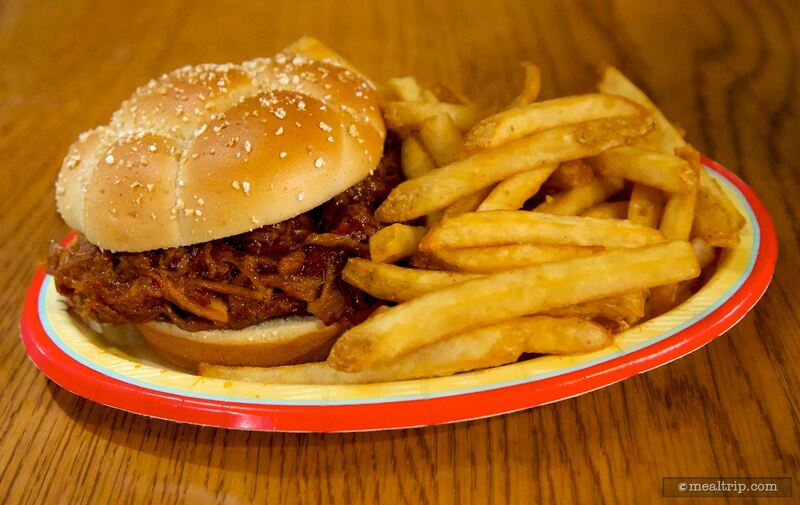 The pulled pork sandwich was extra full of pulled pork in a delicious BBQ sauce. The french fries were hot and tasty. Unfortunately 2 hours before closing, two of the rooms were roped off, but there were still plenty of people that were looking for seating. 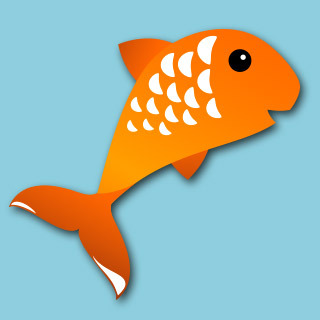 CLICK HERE to view all 14 images in our photo gallery.